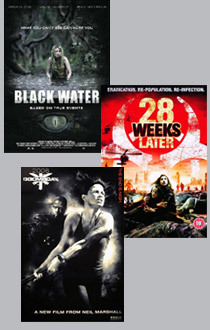 Thanks to all of you who entered our recent competition to win a pair of tickets to the premiere of Black Water (along with the 28 Days Later and Doomsday events) at this year's Film4 FrightFest at London's Odeon West End. Congratulations guys, we will email you shortly on how to pick up your tickets for the event. If you didn't win, why not book your tickets for the event now, but hurry, as tickets for the opening films at this year's Film4 FrightFest are selling out fast! Starting at 9pm on the opening night (Thursday 23rd Aug), the screening of Black Water will see two amazing events happen either side of the film. Kicking the whole event off will be a 28 Weeks Later Special Event – a DVD preview with Producer Andrew MacDonald who will be introducing a special presentation of deleted scenes from the film – including a thrilling dream sequence - and some extra features. 20th Century Fox will be supplying goodies. Following that will be the main presentation - Black Water - a terrifying tale of survival in the mangrove swamps of Northern Australia. Grace, her boyfriend Adam and younger sister Lee are on holiday and decide to take a river tour. When their boat capsizes, in the ensuing panic, their amateur guide disappears into the murky depths. Realizing they’ve come under crocodile attack they climb to safety in a clump of trees. But as the hours go by and with no sign of rescue, they must take some decisive action if they are ever to escape the jaws of the predator relentlessly stalking them. Based on a true story, directors Andrew Traucki and David Nerlich’s tension-laden adventure revolves around an all-too-real life-threatening dilemma. The sudden reptilian attacks, and desperate attempts to get back to their submerged boat raise potent apprehension and imaginatively stretch the suspense to nail-biting levels. The stylish visuals, in particular a midnight nightmare, pay terrific shock dividends too. Then, perhaps the most eagerly anticipated of all, Black Water will be followed by exclusive 'World first' footage from Doomsday, the new futuristic horror / action film by Director Neil Marshall. Neil will take to the stage to introduce the specially prepared footage from the film and then answer questions from the audience. Tickets for all film's showing at this year's Film4 FrightFest can be bought online here. A demonic superhero seeks revenge in a comic book movie filled with breasts and gore. Somehow, it’s really bad.